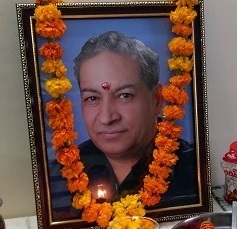 Our dear mentor and Vedic astrology guru, Professor V.K. Choudhry, (Gurgaon, India) passed away peacefully on August 11, 2017 after a short illness. Having written 16 books on the “Systems’ Approach to Vedic Astrology” and having trained more than 800 astrologers in 40 countries worldwide, he completed his earthly karma and is now most certainly in Brahmaloka, the abode of the gods. Like Sage Vyasa, who standardized the Vedas and composed the Brahma Sutras, Puranic literature, and the Mahabharata (which includes the Bhagavad Gita), Professor Choudhry, too, was the embodiment of Mercury – and with focus and divine inspiration – standardized Vedic astrology for contemporary societies everywhere. Professor Choudhry left a tremendous legacy for astrologers worldwide. Those practicing his “Systems’ Approach to Vedic Astrology” paradigm will be tomorrow’s leading astrologers – and who will be eternally grateful for his guidance and the divine light he shined on the field of astrology. Let us carry on his work and build a larger Systems’ Approach foundation — so that future generations will be able to follow in Professor Choudhry’s footsteps — giving accurate, relevant, practical and replicable astrological advice that leads to peace of mind and purpose of life.